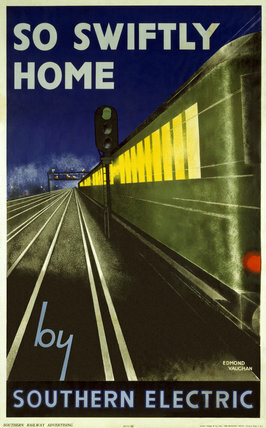 'So Swiftly Home', SR poster, 1932. Poster produced by Southern Railway (SR) to promote electric train services. Artwork by Edmond Vaughan. Dimensions: 1010 mm x 630 mm. 'South for Winter Sunshine', SR poster, 1929. 'South for Winter Sunshine', BR reproduction poster, 1995. 'South for Winter Sunshine', SR poster, 1932.